Welcome to the Shawn Rhoden Official Updates thread! 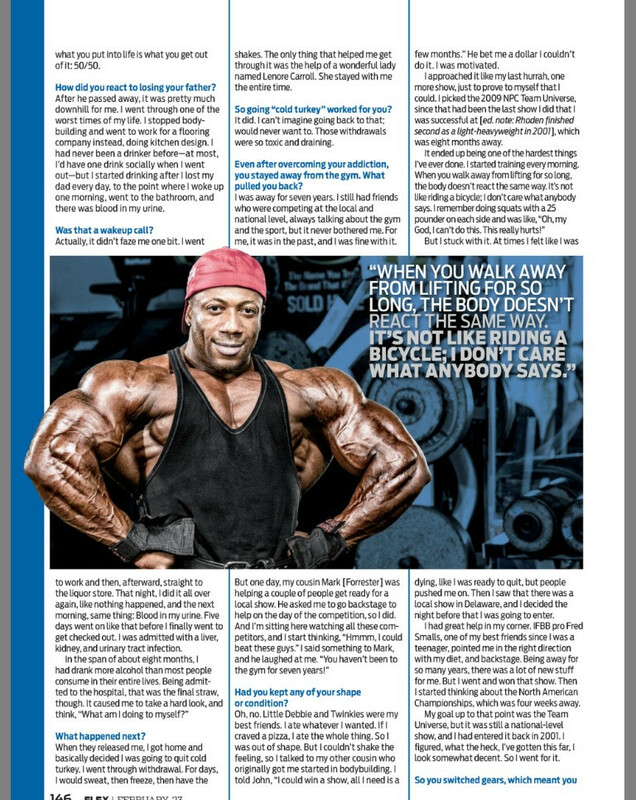 Keep up to date with the latest Shawn Rhoden News including pictures, schedules, anything and everything! Last edited by MuscleMecca Crew; 12-11-2017 at 11:49 AM. I dont think he will do much in the olympia because i dont think he has enough years in him to bring up his back as much as he needs to but damn he is an amazing bodybuilder when it comes to aesthetics. the Jamaican-born former soccer standout, who has faced misfortune head-on, including the devastating loss of his biggest fan, his father, to cancer, and the tailspin and dangerous drinking addiction that ensued. he could accomplish the physical peak that he had once abandoned. 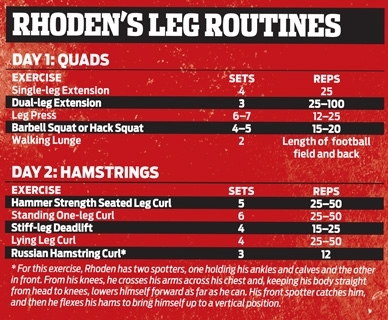 The following two sets are only 50 and 25 reps, respectively, but the point is still made clear?a higher rep range will be the order of the day as Rhoden pursues his goal of a very compromised, painful walk back to his car. a FLEX reporter, would have been met with an incredulous stare from Rhoden. in Jamaica, I had never even seen a dumbbell, he says, laughing. I wanted to be the next Pel?, the next Maradona. [Football] was the only sport I knew. He lived with his mother and three brothers in the Caribbean nation, spending time on the football pitch and on the island's world famous beaches, while his father, a Washington, D.C., native shuttled back and forth between Jamaica and his job in the States. Finally, he decided that all the travel was just too much, Rhoden recalls. He saw that there would be better education and opportunities for us, and in 1990, he started the paperwork to be able to move us all to D.C. with him. and, along with soccer, picked up a second sport, swimming, excelling in both. It was a cousin, John Lancaster, who first introduced him to weight training in 1992, when he was nearly 17 years old. The foray was meant to merely complement his other athletic endeavors, in the summer between his junior and senior years. While many other bodybuilders wax philosophic about how they fell in love with the iron game at first lift, Rhoden harbors no such romantic notion of that day. The next morning, I woke up and everything hurt, he says. I called my cousin every swear word. I went off and told him, Dude, there's no way I'm going back to the gym. I'm going to stay in bed a couple of days, and then never do that again. it was experiencing. Rhoden relented. I was like, Wow, this is fun. This is great. We ended up doing shows every other weekend that summer, and I kept winning. Fortuitously, Lancaster had an old acquaintance who happened to know a thing or two about the sport: Maryland native Yohnnie Shambourger, a 1995 Team Universe champ who has three top-five Masters Olympia finishes to his credit. of it as you put into it. The leg press is a highlight of Rhoden's week, but anyone outside the iron brotherhood would struggle to understand why. What becomes a grueling gantlet begins innocently enough, with four plates per side for 25 reps.
the top side bar for good measure. Afterward, plates are transferred back to the tree, the water bottle is emptied into his gullet, and Rhoden moves on to hack squats. As he explains, he uses hacks and barbell squats interchangeably at this point in the workout. (Front squats make an appearance sporadically, too.) He also shares his penchant for variety. Sometimes on the hack squat, I'll use a wide stance to target my glutes a little more, sometimes a close stance to target quads, or turn my toes in or out, he says. I'll play with my exercises according to what I see in the mirror or what parts of the muscle group I think I need to bring out a little more. The hack machine brings five more sets, reps in the 15?20 range, always a fluid motion, and no long lockouts to maintain tension on the muscle. Seeing Rhoden enjoying each aspect of his workout, it's hard to believe he quit training for seven years, walking away just as he was on the verge of breaking through to the pro level. Why, is a subject that, while not a fresh wound, is still very deep and stings to the touch. In 2001, I did the North American and took second; in the Team Universe, I took second, he says. Everything was going well. The following year, I started prepping for Nationals but ended up with food poisoning. I went ahead, though, and finished far back, at 14th. When I returned home, my dad wasn?t himself. I couldn't figure it out. However, Rhoden refocused and got back to the gym, determined that 2003 would be his year. I was at the gym and got a call from my brother that they had to take Dad to the hospital with shortness of breath. This is a 58 year old man who had never been sick a day in his life, never missed a day of work, was always on the go. By the time Rhoden arrived, his father was hooked up to eight different machines and the doctors were prepping him for transfer to a different facility where they could better treat the massive fluid build-up in his lungs. Everything happened so fast, he says. A week later they said he had Stage 4 lung cancer. We were very naive to any kind of cancer, so we asked, OK, what do we need to do as far as surgery? They said, No, it's not like that, he has three to six months to live. During this time, any thoughts of bodybuilding were cast aside. My dad was my biggest fan, Rhoden says, smiling at the memory. He used to always have a VHS tape of me competing with him at all times that he would show his friends or anyone who would watch. Everywhere I went, they were like, Hey, you're Lloyd's son. We saw your show. I'm like, What show? They had seen my dad's tape. I remember being in the hospital, and he asked, So, when are you getting back onstage, when are you going to compete again? I said, I will. That night I was home and folding some clothes and had a vision. It was my dad talking to me. He said, Everything is everything, everything is 50/50, what you put into it is what you get out of it. I heard my phone ringing, and I knew he had passed away before I even picked it up. That was him making his final rounds to everyone. As Rhoden explains succinctly, After that, it was pretty much downhill. Never much of a drinker before, Rhoden went on a binge. In the span of six to eight months, I drank more alcohol than most people drink their entire lives, he admits. I had given up training and was doing the kitchen design, working for a flooring company. At night, I was drinking heavily, and then I'd get up, go to work, and that night do it again. One morning, he got up, went to the bathroom, and there was blood in his urine. It didn't faze me one bit, Rhoden says. That night, I went out and had about 15 drinks, then went home, and the next morning, same thing. By the fifth morning, however, he finally went to the hospital and was immediately with a liver, kidney, and urinary tract infection. Lying there, I finally stopped to think. What the hell am I doing to myself. So when I recovered and they released me, I got home and decided I was going to quit cold turkey. With the help of a friend, Lenore Carroll, the detox began and as he tells it, the experience was hell on earth. For days, I had shakes. One minute I was burning up, the next I was freezing cold. It was so difficult, one of the hardest things I've ever been through. Whenever I see a drink now, I still think of it, and I never want to do that again. Emerging from addiction, Rhoden started taking each day one by one. He immersed himself in work, in survival, and as he lost his muscularity and condition, his former life as a bodybuilder slipped ever further away. But it didn't concern him. Without his No. 1 fan in his corner, and without a competitive spark to fuel him, he simply walked away for six long years. For the final exercise of Rhoden's leg regimen, he grabs a 45-pound plate and heads for the exit. It's a chilly morning in late November, cloud cover blotting out the sunlight, coating everything in a grayish, dull palette. Rhoden is undeterred, of course. He looks to the end of the lot, about a hundred yards east, and secures the plate to his chest by crossing his arms over it. With a deep breath, he steps forward with his right leg, descending into what will be the first of many lunges. Methodically, purposefully, he continues, surely and steadily making his way down the three-quarters-full lot, encountering little traffic as he reaches the curb and turns to start back without a break. No need to stop, I want to keep tension on the muscle, he'll explain later, between his two trips up and back. of guys get ready for a show, and he asked me if I would come help him with prep backstage, he recounts. I said no at first, I just didn't do that stuff anymore but he pushed and I went. Backstage, he looked around, seeing some familiar faces, some not so familiar, and a nagging feeling bubbled up inside him. I thought, I could beat these guys. Give me a couple of months, and I could beat them. It was an odd statement coming from a guy who had let his body go. Who, as he says, had Little Debbie and Twinkies as my best friends. But the next day, he talked to his cousin Lancaster, who promptly bet him $1 that he couldn't do it. Now I'm motivated, Rhoden says. I wanted to do one more show, one more hoorah. Afterward, I would walk away and call it a day. I chose the Team Universe, the last show that I had done where I was successful, which was eight months away. The next morning, and for many after that, Rhoden made his way to the gym, undertaking what proved to be a much more difficult challenge than he had anticipated. When you stop lifting for so long, the body doesn't react the same way, he reflects. It's not like riding a bicycle, I don?t care what anybody says. I remember trying to squat with 25s on each side and was like, My God, I can't do this; it really hurts! 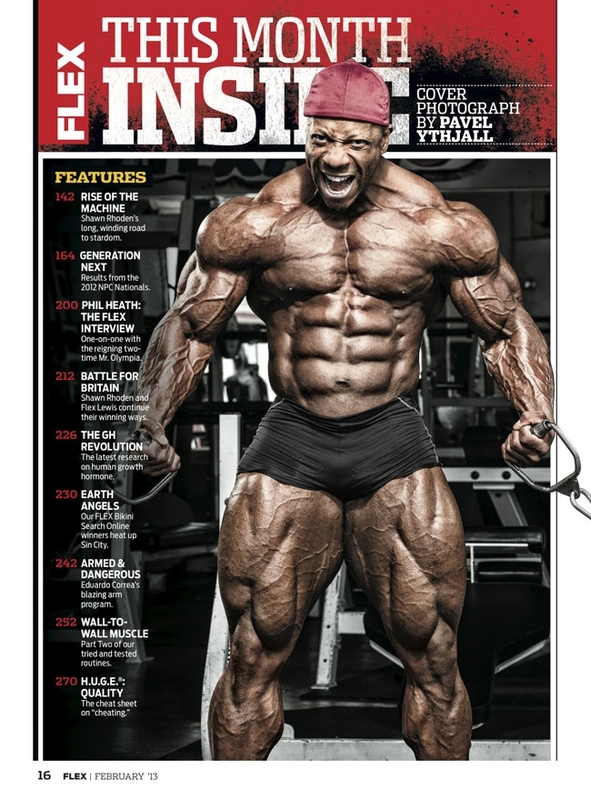 A motivational trip to the Arnold Classic and Expo in March of 2009 was a catalyst, as old friends from his competitive days urged him on, and the sight of pros like Kai Greene, Victor Martinez, and Branch Warren ignited the fire. It was on. 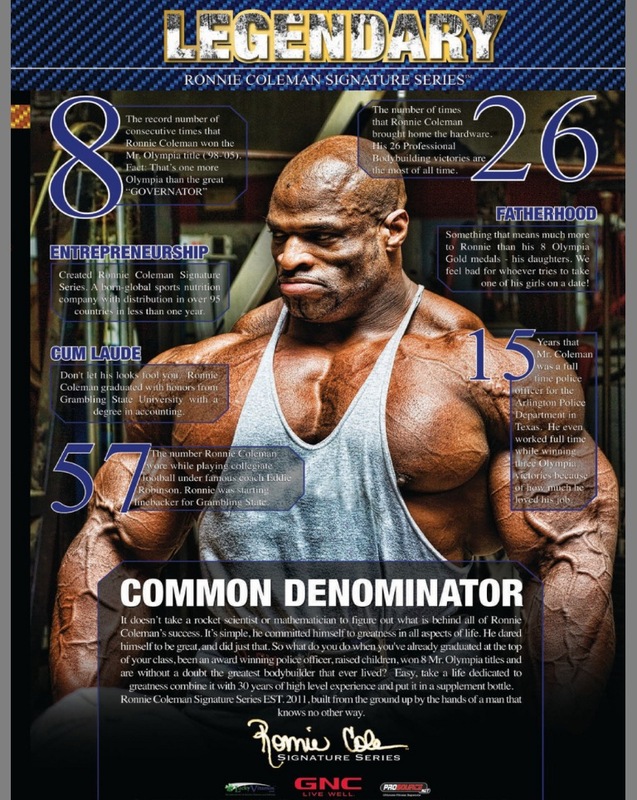 And on Aug. 29, in Cleveland, OH, after a last-minute decision to jump into the North American Championships instead of waiting for Team Universe, Rhoden shocked everyone in 2009 by winning the heavyweight overall championship title, earning his IFBB pro card. 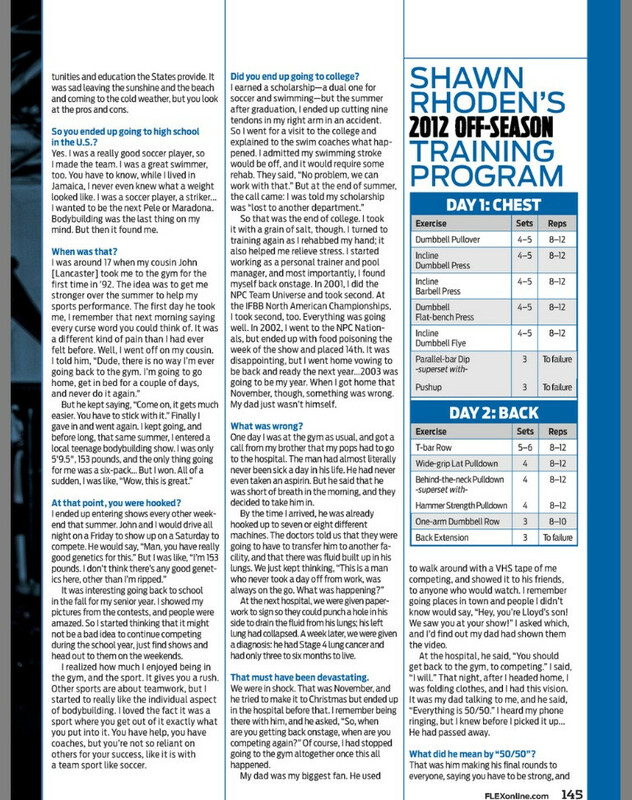 Two years later, after two pro shows, one disastrous (14th at the 2010 Europa Super Show), one redemptive (third at the 2011 Europa), thanks to help from consultant Dave Kalick, who dialed in his nutritional program, Rhoden had qualified for the pinnacle contest of his chosen sport, the Mr. Olympia. I wish everyone who turns pro could experience the Olympia, because it?s not like any other show you've ever been to, he says. From the day they send out your contract, to scheduling your hotel and flight, to the press conference and meeting the fans, it's incredible. They treat you like a pro athlete, like you?re wanted. To be on the same stage as guys like Flex Wheeler, Shawn Ray, Kevin Levrone, Ron Coleman, and to make the second callout with Dexter Jackson, Jay Cutler and Phil Heath?even if I never compete again?that would have been an awesome way to finish. Of course, he is competing again, launching his 2012 campaign in the Flex Pro in Santa Monica, CA, on Feb. 18. My goal is to win the Flex Pro; I?m going in with confidence that this could be my show.? He says. That's my focus right now. The Flex Pro gives me a great opportunity to showcase what I've accomplished this off-season in the sport I've had. With ever-improvising size, muscle density, balance, and condition that builds upon his prodigious genetic gifts, Rhoden is indeed a threat to win the Flex Pro. But win or lose, you can expect one thing: He'll continue strive, knowing that he'll get out of the sport exactly what he gives. A 50/50 proposition, just like his No. 1 fan always told him. Last edited by MuscleMecca Crew; 03-02-2018 at 09:58 AM. 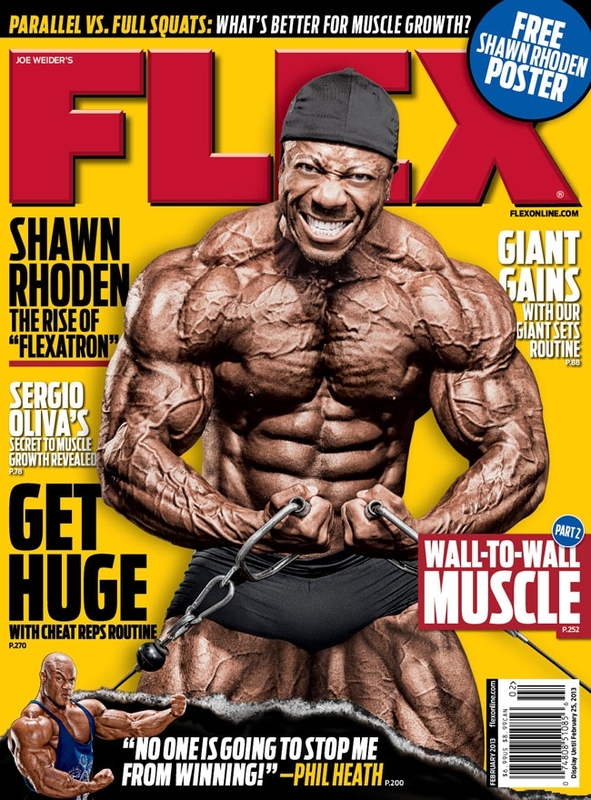 Plus his cover for the FLEX magazine, February 2013 issue! Last edited by MuscleMecca Crew; 01-11-2018 at 08:36 AM. Yeah Buddy! My boy Shawn going to tear it up this year. thanks for the updates. shawn has a bright future ahead of him. he just needs more upper body thickness. and hopefully he doesn't ruin his lines. def one of my modern favorites. Last edited by MuscleMecca Crew; 03-02-2018 at 09:59 AM. Good interview, are the next two up yet? Last edited by COACH; 07-30-2013 at 03:25 PM. ^^ thanks for the updates, COACH! 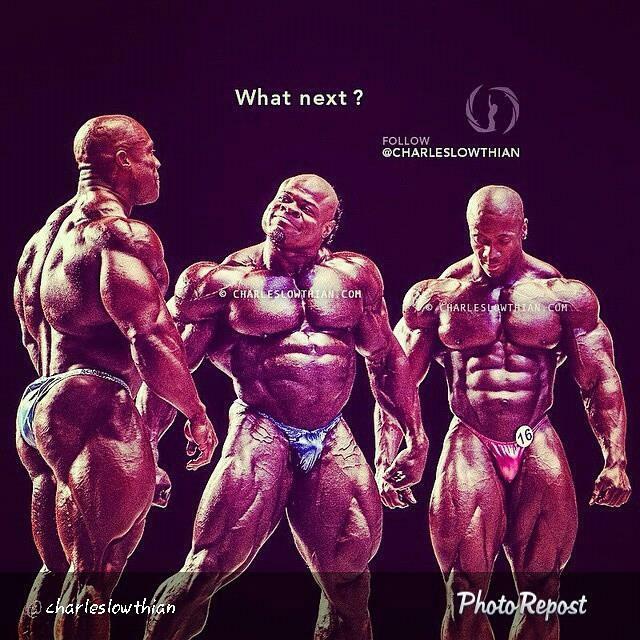 Shawn Rhoden Updates Topic! 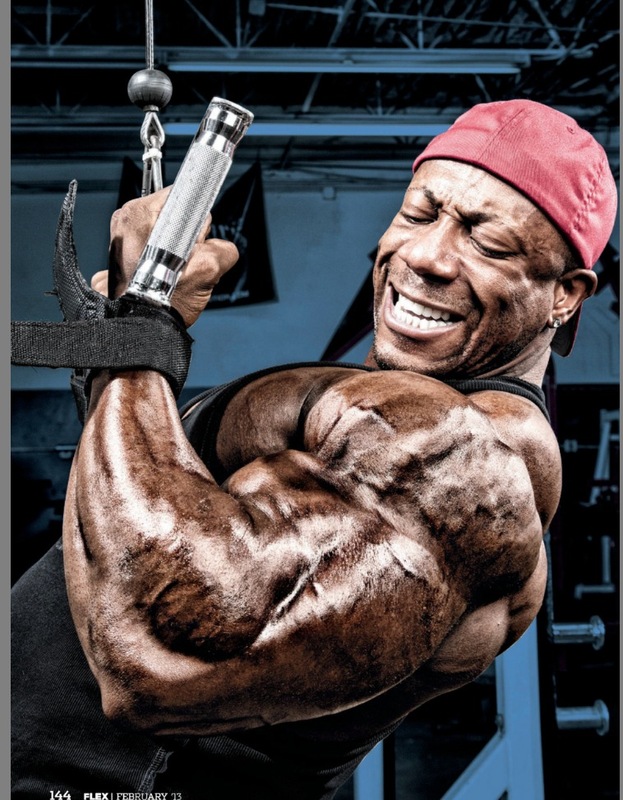 What is going on with Shawn Rhoden? Find out here. Last edited by TalkAdmin; 10-18-2016 at 10:59 AM.